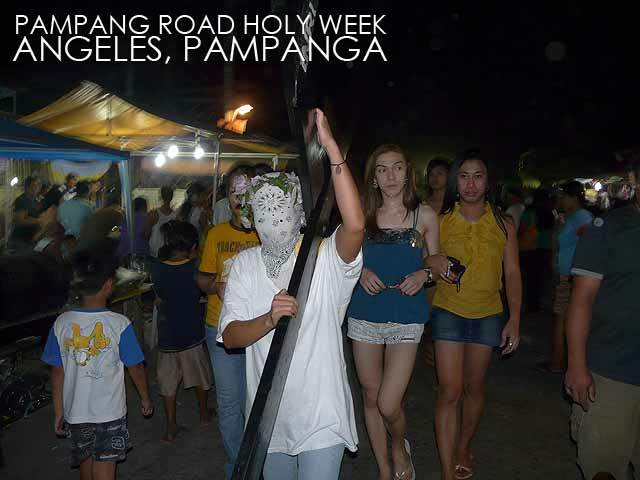 Pampang Road in Angeles City is another convergence point of Holy Week penitents. The sad part is they've created a circus out of the whole spectacle! 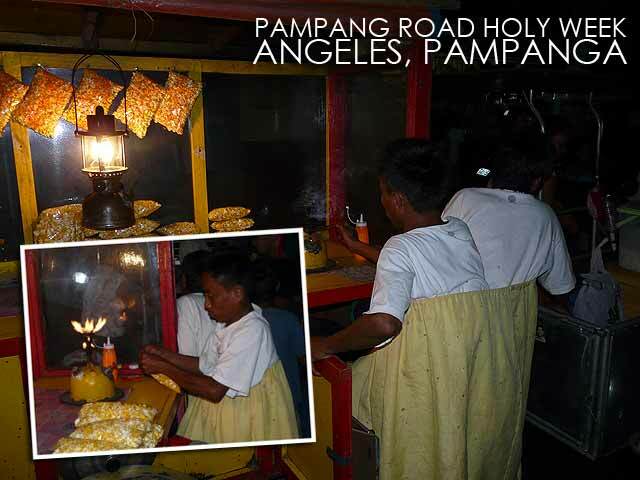 We passed by Pampang early in the evening of Holy Thursday. The whole area was teeming with people. 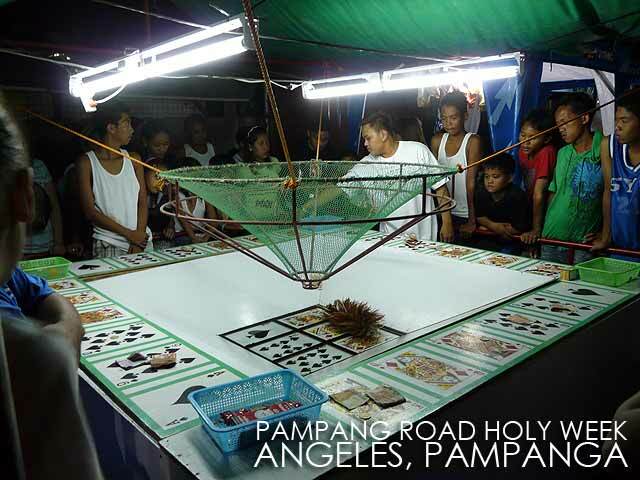 The roads around the crucifixion site and the pabasa were transformed into one big perya sans the rides, but with the games and gambling, tiangge, and the freaks and peculiarities that usually accompany a perya. There were food stalls everywhere and people were drinking. It obviously didn't feel like Holy Week. 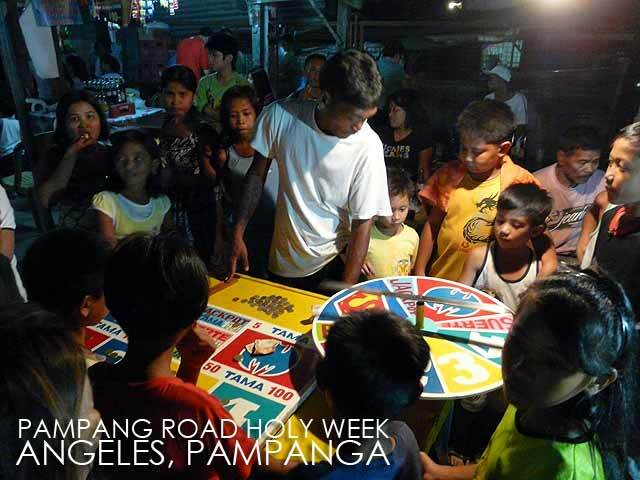 It surprised us that this Holy Week subculture of Pampanga had existed under our noses for so long. And yet it was only now that we had discovered it. As we walked towards the pabasa area, we saw more of the action. Street food of all kinds was available. There were different kinds of games and gambling tables, even a pair of Siamese twins selling popcorn. 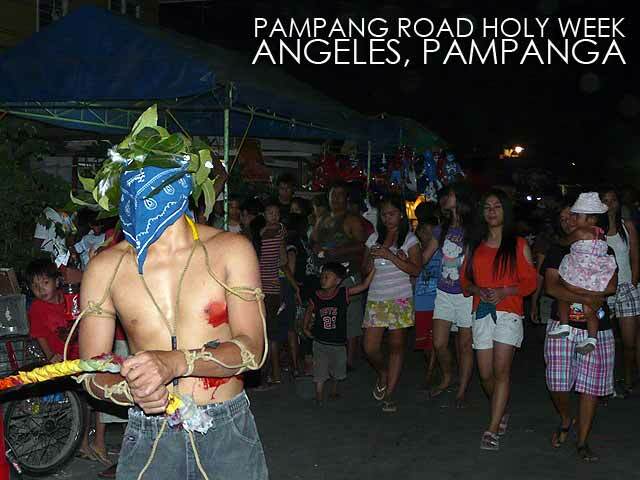 Then came in the penitents, one by one they entered Pampang Road and proceeded to the pabasa area. We saw a trio of magsalibatbat tied together, crawling their way to the pabasa. Poor souls! The crowd around them was as irreverent as one could think: gawking, giggling, girls shrieking as they took photos of them on their mobile phones, kids running around and blocking their path. There were flagellants. And then, there were those carrying crosses or mamusan krus, one even accompanied by a bevy of cross-dressers in very short shorts. What was missing were the kristos who would be nailed the next day. And the cast of magdarame was complete. The hill were the crucifixions were to take place had been wrapped around in banderitas of San Miguel Beer. Indeed, being the center of action, it was prime advertising space! Even worse, I would later find out that the local government sold tickets for prime seats to view the crucifixions!¡Qué horror! The local government has obviously been cashing in and taking advantage of these annual panatas. 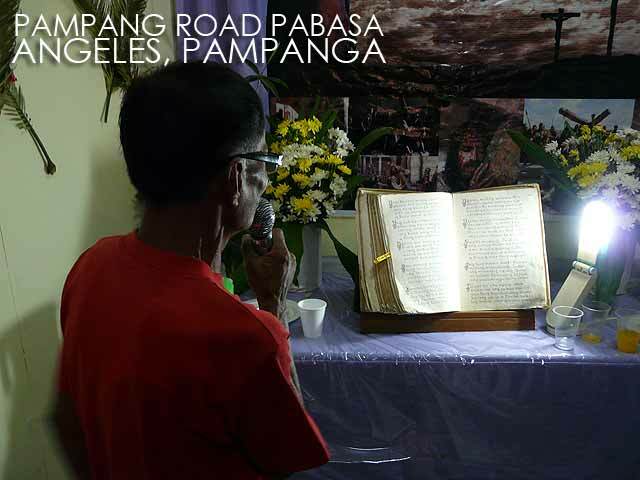 The pièce de résistance was a streamer of a local politician trumpeting that Pampang Road was a tourist attraction on Holy Thursday and Good Friday! Indeed it is an attraction for those who are fans of these peculiarities. 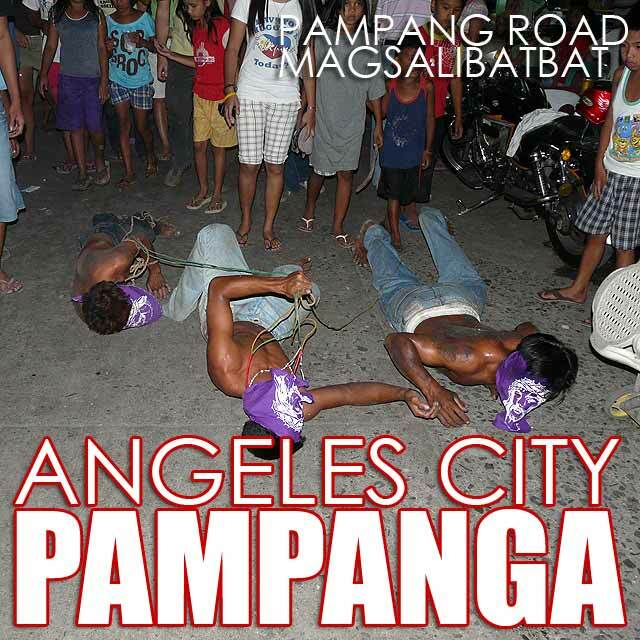 I guess this part of Angeles City was simply living up to the city's moniker of Sin City. This chaotic scene must have been similar to that of when Christ cast out the money changers from the Temple. 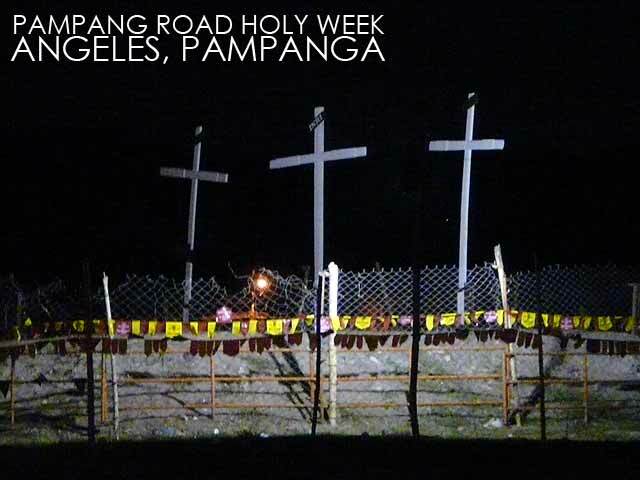 I wonder who, if any, will cast this irreverence out of Pampang Road next Holy Week. While we celebrate the uniqueness of this subculture, I cannot but feel sad that people there have forgotten what Holy Week is all about. While many may argue that we do celebrate Holy Week in various ways, let's never forget the meaning of Holy Week and the life, death and resurrection of Christ which we commemorate. At the same time, let's not exploit the penitents by earning, especially from corporate funds, out of their panata. I guess the buzz in Pampang simply mimics what happens at a wake. I was reminded of a book by Renato D. Tayag called The Sinners of Angeles which bravely tackled the political corruption in Angeles in the 1960s. 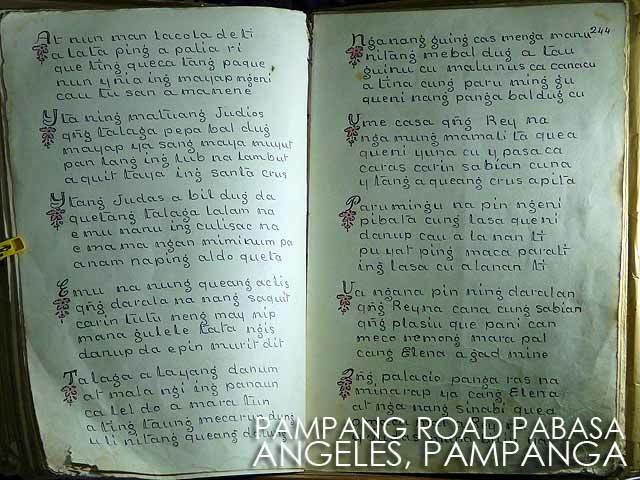 The subculture of Pampang Road is indeed worth writing in another book. 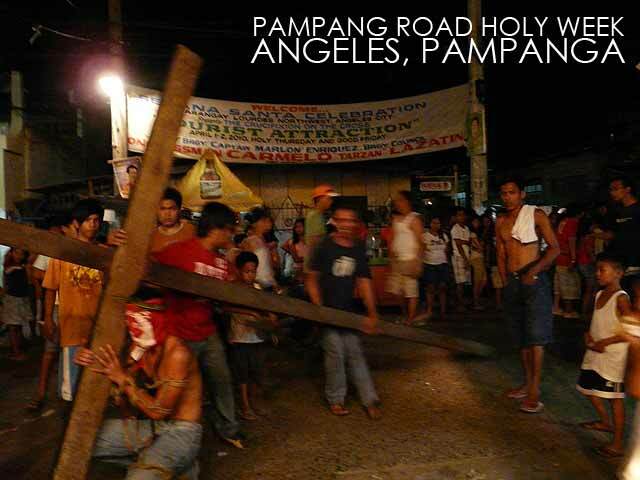 I'm from Angeles City and I really think, the true meaning of Penitents and Holy Week have long been forgotten. 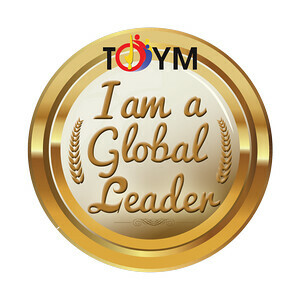 Many people have took advantage and made this as money making event. 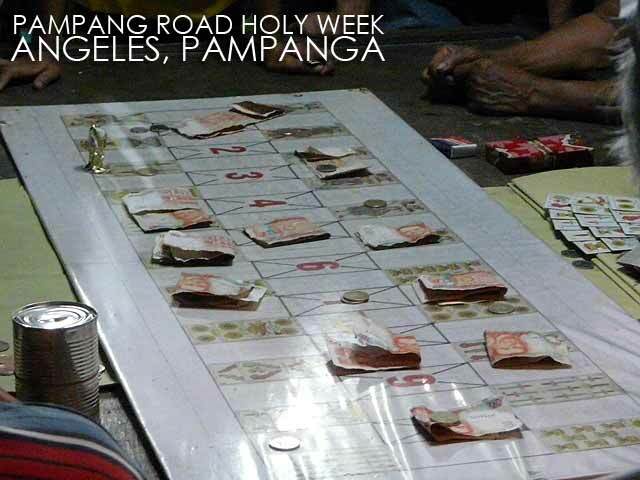 How can you think of drinking and gambling during Holy Week? The essence of being Holy of this event is gone! Perya...tiangge...gay mandarames...what will they think of next?